Known scientifically as Solanum Lycopersicum, the tomato is the berry of a plant from the nightshade family, native to South America. Despite technically being a fruit, the tomato is generally categorized as a vegetable. The tomato is consumed in diverse ways, including raw, as an ingredient in many dishes, sauces, salads, and drinks. They are usually red when mature, but can come in a variety of colors, including yellow, orange, green and purple. Here on these page we will see common health benefits of tomatoes. 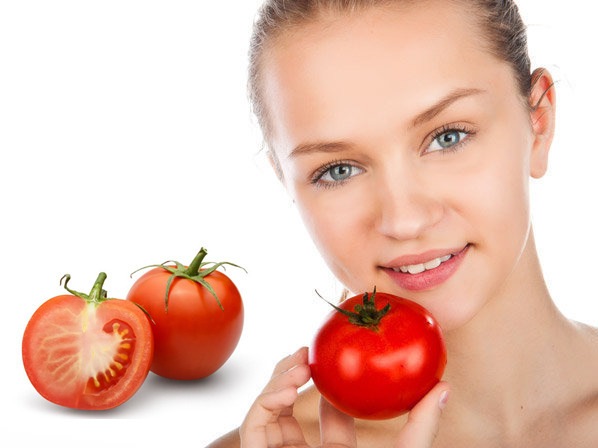 Do you know eating tomatoes regularly can also help you get gorgeous skin. Only few people make the connection between this common garden fruit and the benefits of eating tomatoes for your skin. Tomatoes contain an ultra-potent antioxidant called Quercetin, a super protector that has endless benefits, including the ability to reduce inflammation. 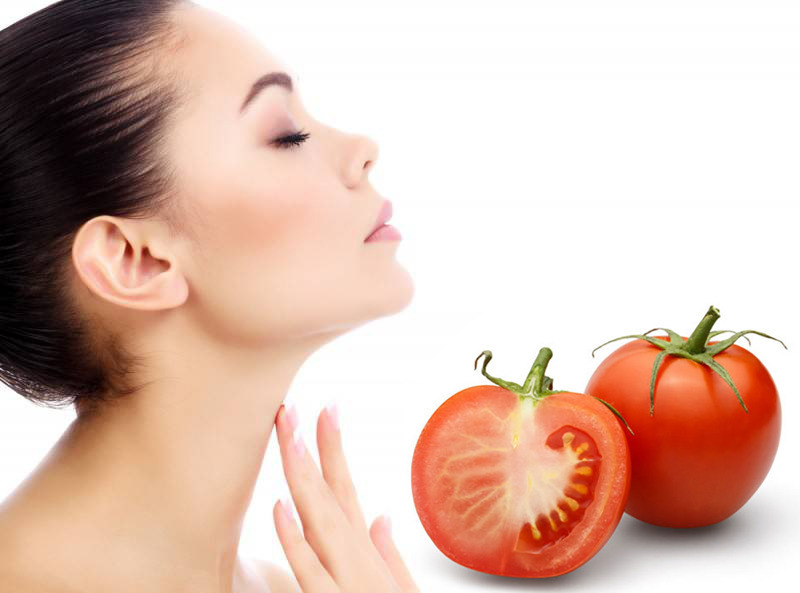 Get a fairer and glowing skin with this few tips on using Tomatoes. With their high antioxidant content from vitamins A, C, and E (including fat soluble tocopherols), tomatoes fight against free radicals and reduce the visible signs of aging. Salicylic acid is an amazing ingredient in tomatoes that has clarifying and pore refining properties key for clearing up problem skin. An astonishing fact about eating tomatoes is that their high levels of lycopene help shield the skin from sunburn. This protection happens internally but also works externally. According to folklore, farmers working on a hot summer day would crush tomatoes onto their skin to keep it from burning! Tomato juice works as an excellent astringent. Mix one spoonful of tomato juice with 4-5 drops of lemon juice and apply on your face. Rinse with lukewarm water to shrink open pores. To reduce acne apply a mashed tomato all over your face, wash it off after an hour and apply a good moisturizer. With regular use you will notice a reduction in your acne. On rubbing the tomato slices into blackhead affected areas helps to cure your skin of this annoying problem. A blend of tomato juice and honey can give you a fairer and more glowing complexion. Banish dull and drab skin with this magical blend. They are usually red when mature, but can come in a variety of colors, including yellow, orange, green and purple. There are many subspecies of it, with different shapes and flavor. Lycopene is the antioxidant that gives them their rich red color. They account for 80 percent of lycopene consumption. The water content in them is around 95%. The other 5% consist mainly carbohydrates and fiber. 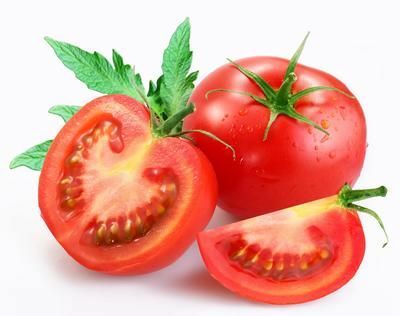 They are the major dietary source of the antioxidant lycopene, which has been linked to healthiness, including reduced risk of heart disease and cancer. They are also a great source of vitamin C, potassium, folate and vitamin K. They are the rich source of vitamins A and C and folic acid. They contain a wide array of beneficial nutrients and antioxidants, including alpha lipoic acid, lycopene, choline, folic acid, beta-carotene, and lutein. They are good for your skin as they have a high amount of lycopene, a substance found in many of the more expensive over-the-counter facial cleansers, they are great for skin care. They help to prevent several types of cancer. The antioxidants present in them are scientifically found to be protective against cancers. Being rich in natural fiber they maintain the vitality of the colon as it reduces the risk of prostate cancer. Because of all that vitamin A, it is also an excellent food to help improve your vision and eyes. Are naturally low in sodium, saturated fat, cholesterol, and calories. They can keep your blood sugar in balance, as they are very good source of chromium, which helps to regulate blood sugar. Vitamin A content is very high in a tomato, so it’s good for keeping your hair strong and shiny, and its also good for your eyes, teeth, skin, and bones. They keep the digestive system healthy by preventing both constipation and diarrhea. Tomatoes can enhance the flavor of almost any cooked dish. 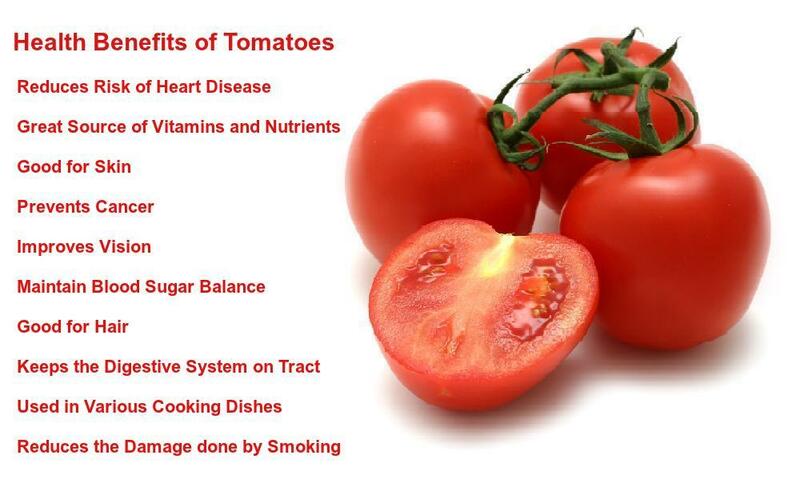 Health Benefits of Tomatoes in reducing damages done while smoking. They contain chlorogenic acid and coumaric acid, which help to fight against some of the carcinogens brought about by cigarette smoke. thanks for giving me the health benefits of tomatoes​.